Coffee is one of the most important commodities traded internationally. Its commerce impacts the lives of millions of coffee workers around the world, and many countries depend on this trade as their main source of foreign income. The recent decline in coffee prices, now at historic low levels, has created havoc in the economies of these countries. In El Salvador alone, a small coffee producing country of 5.8 million inhabitants, 80,000 jobs were lost in the coffee sector in 2002. The blow has been felt the most by the small farmers in Latin America, the Caribbean, and Africa. Coffee growing regions are draped over a satellite image mosaic of Ethiopia (source: Landsat ETM+ data from the EROS Data Center). Consumers and marketers can access production data collected as part of a pilot project. The applications described below identify the role that readily accessible and georeferenced information can play in supporting the development of specialty coffee markets to secure premium market value. The term specialty coffee refers to several categories of coffee, such as single-source, gourmet, premium, organic, shade-grown, bird-friendly, and fair trade, which command better prices than the traditional coffee brands found on supermarket shelves. An increased trade in specialty coffee benefits both coffee producers and the environment. Specialty coffee production is often done in a sustainable way that helps maintain healthy forests and ecosystems. In El Salvador, for example, approximately 60 percent of forest cover is associated with shade-grown coffee. In Mexico, Smithsonian biologists found that coffee plantations with protective tree cover support more than 150 species of birds, a greater number than is found in other agricultural habitats and exceeded only in undisturbed tropical forests. When compared with the traditional coffee market, the specialty coffee market requires better information as well as increased transparency in transactions. Information is required on several aspects of coffee production and marketing including exact location of coffee farms, cooperatives and mills, socioeconomic conditions, environmental and climatic data, production and milling processes, materials and inputs used in coffee production, and general marketing information. 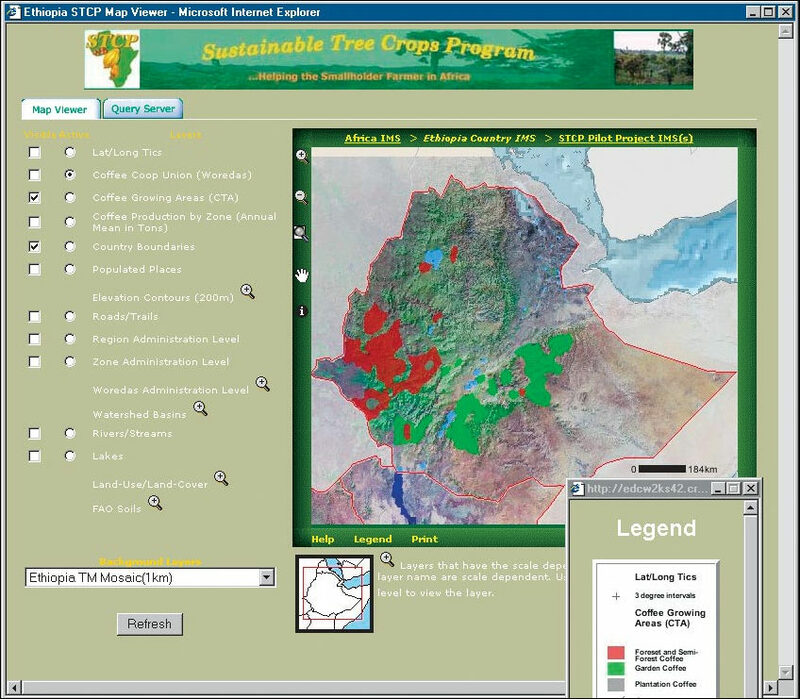 The U.S. Geological Survey (USGS) Earth Resources Observation Satellite (EROS) Data Center (EDC), with funding provided by the United States Agency for International Development (USAID), is responding to the need of coffee producing countries in Latin America and Africa to develop and exploit the specialty coffee market by assisting them in the development of ArcIMS software-based marketing and certification systems. Applications have been implemented in the Dominican Republic, Peru, and Ethiopia as well as in several Central American and African countries. Leonidas Batista, head of the Dominican Republic Coffee Board (Codocafe), sees this type of application as the way forward, "The new specialty coffee market demands timely and accurate information, the provision of which can be greatly facilitated by the use of information tools and data sets that can be integrated on the Web by Internet Map Servers." As part of a cooperative project in the Dominican Republic, Codocafe, the Dominican Agricultural Research Institute, coffee cooperatives, USAID, and EDC have teamed to implement certification and marketing tools based on documented practices, appropriate conservation, and biodiversity protection; robust and maintained databases; and tools provided by ArcGIS and ArcIMS. Of the 45,000 coffee holdings in this country, the ArcIMS application developed by the project contains detailed data and georeferenced positions of more than 2,000 farms already producing specialty coffee or with the potential to do so. Individual coffee farms are precisely mapped with handheld GPS devices, and a variety of data is collected for each farm, ranging from geographic and climatic conditions, socioeconomic data, and production information to harvesting periods, certification issues, and types of protective trees. 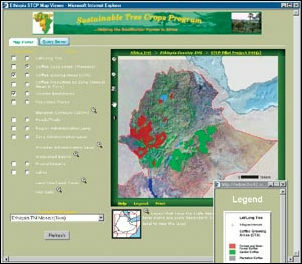 The data is integrated into databases, converted to digital maps (ArcView shapefiles) for online visualization, and displayed together with other existing and newly generated spatial data sets such as protected areas, forest cover, shaded relief, topography, hydrography, cities and towns, and river basins. Other specialty coffee online mapping projects initiated by EDC in Peru and Ethiopia follow a similar approach. Who Benefits From These Applications? Benefactors of these applications are numerous. Take, for example, coffee traders in the United States or Europe. With the use of a simple Internet browser, they can consult the Dominican Republic ArcIMS application, easily choose to visualize those farms located in the central mountain range higher than 1,000 meters in elevation and producing certified organic coffee, and contact the cooperatives producing the coffee they are interested in to obtain samples. Government officials, scientists, and other users might have different needs for information such as which coffee farms are located in areas without protective forest cover or at altitudes unsuitable for coffee production or which farms have received subsidies or have been affected by specific coffee pests. Searches are made possible by accessing a powerful query engine developed by EDC specialists using ArcIMS and Active Server Pages (ASP). Search results are displayed in both map and tabular format for easy consulting and printing. John Becker, USAID agricultural policy advisor, views these ArcIMS applications as part of a bigger agricultural verification effort, "To certify you must be able to verify, and the collection, transfer, and storage of digital evidence provide a cost-effective method of verification. The combined use of the Internet with GIS and GPS to help certify specialty coffee represents just the beginning of the new, expanding field of agroecological system verification that is being driven by market-based and regulatory requirements for traceability and identity preservation in globally traded agricultural products." These technologies, combined with the use of remotely sensed data, also offer the potential to monitor several environmental indicators such as the impact of coffee production on adjacent forests, the maintenance of forest corridors among coffee producing areas, the encroachment of coffee farms in protected areas, shade tree density, and volume of sequestered carbon, among others. For more information, contact Eric van Praag (e-mail: vanpraag@usgs.gov) or Eric Wood or Larry L. Tieszen, USGS EROS Data Center, 47914 252nd Street, Sioux Falls, South Dakota 57198 (tel. : 605-594-6169, fax: 605-594-6529), or visit www.dominicancoffee.com or www.treecrops.org or www.perucoffee.com or edcintl.cr.usgs.gov to view the systems in operation.